Labyrinth, a photo by aghrivaine on Flickr. 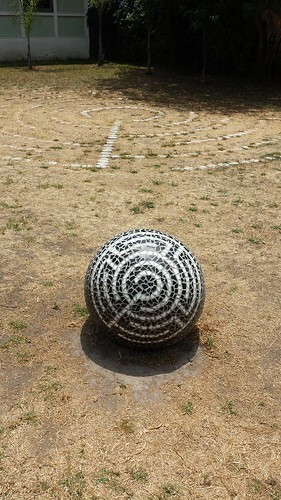 Sometime last week I ran by this Labyrinth on San Juan street in Venice. The confluence of both San Juan (site of several merry adventures) and walking a Labyrinth as I have done in the past stuck out, and I resolved to come back and walk it when I wasn't out of breath and sweaty. Well, one out of two ain't bad... after a family walk (our first with the entire family together) to the beach, we came back and happened on it. So while Pascale and Eowyn waited in the shade, I cleared my mind, and stepped into the maze. The question I had on my mind was "How can I be a good father?" I tried to pay attention to the path. In this photo, the shadowed area, perhaps appropriately, was covered over with fallen leaves, so I had to be especially careful there not to overstep the bounds. All while keeping my question in my mind. There's no magic, of course. And any way, the physical universe we live in is so complicated and weird and glorious, magic would just be gilding the lily; wholly unnecessary and a distraction from the real beauty. But keeping focused on one thing while thinking about another has its own kind of magic, the re-alignment of neural paths and the clicking together of previously sub-conscious bits. And sure enough, as I found myself in the center of the spiral, a sentence popped into my mind, as if spoken by another. "Don't mark the route; just giver her a map and a compass." There it is, how to be a good father. I'll give her the best, most accurate map to the good life that I possibly can. And I'll give her the best, most accurate compass to being and doing good that I possibly can. But she'll find her own route, and that will be far better than me trying to bend a course for her, since this way she can come back from her adventures, and tell me what she's discovered.